2017 Topps Wacky Packages Old School 6 offers collectors a variety of nostalgic stickers in a limited-time format. The wacky online exclusive is sold directly by Topps for just one week before being retired from production. Although it's been several years, Old School 6 is the follow-up to 2014's Old School 5 set. 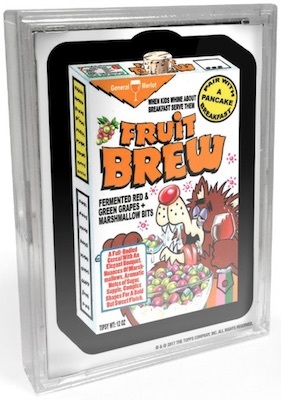 Seemingly no company is too big to receive the Wacky Packages Old School 6 treatment, with parody images for notable brands such as Bazooka Bubble Gum, Fanta, General Mills' Fruit Loops, Johnson's Baby Powder, and Quaker Oatmeal. Even Topps isn't safe as the set features a "Torn" brand of Ugh! Stickers. 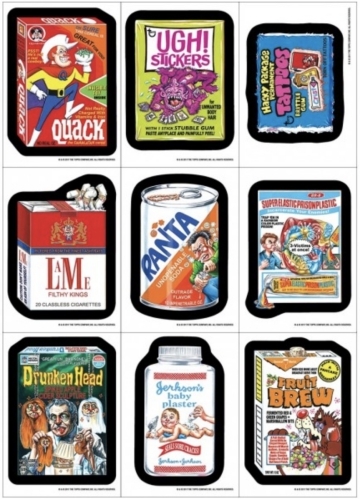 Shop for Topps Wacky Packages Old School 6 Sets on eBay. The Old School 6 checklist totals 30 base cards with three different back parallels: Tan, Ludlow Black, and Ludlow Red. Additionally, Pencil Roughs and Sketch cards are also available and come in each format. 2017 Topps Wacky Packages Old School 6 is available to purchase as either a complete set for $150 or as a single pack priced at $50. Despite not indicating a specific print run, 2017 Topps Wacky Packages Old School 6 "has a very limited quantity," and will only be sold until November 22 (or while supplies last) via the Topps Online Store. 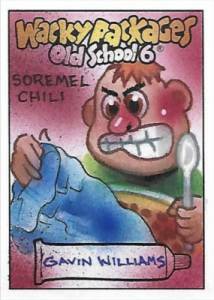 2011 TOPPS WACKY PACKAGES OLD SCHOOL 2 ENV 3 5X7 STICKER 2 CONCEPT CARDS MORE!!! 30 cards. Shop for Old School 6 sets on eBay. 10 base cards per pack; 30 per complete set. PARALLEL CARDS: Tan, Ludlow Black, Ludlow Red. 5 parallels per pack; 15 per complete set. Final Print Run is 1,200 sets. 5 pencil roughs per pack; 15 per complete set. Shop for Old School 6 Pencil Roughs on eBay. 1 sketch per pack; 3 per complete set. Shop for Old School 6 Sketch cards on eBay. 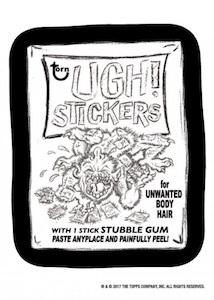 Enjoy some related Wacky Packages cards with our other detailed guides.